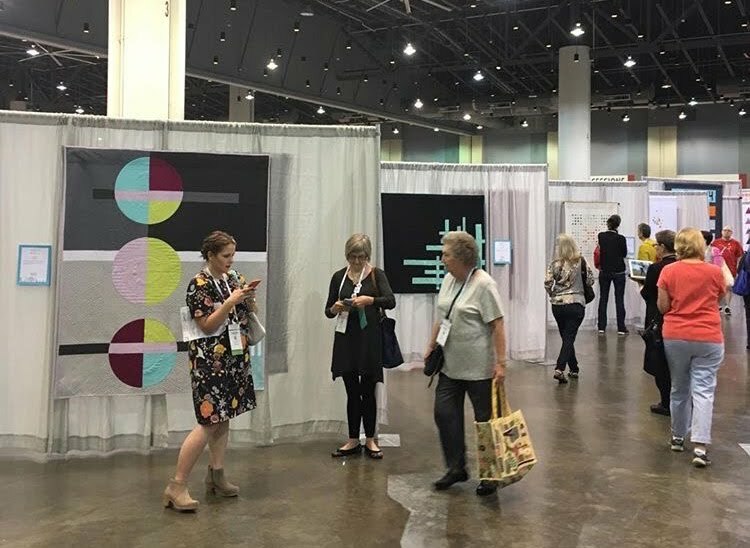 I was not able to go to Quiltcon this year but thanks to my friend Christy (@catbend) and an IG friend Karen (@quiltaposy) I have some pictures of my quilts to share. The show looked amazing! I know there was alot of hard work and organization behind the scenes and even though I wasn't there I want to thank the MQG, especially Heather Grant who hunted down my missing, not really missing just mislabeled by me, quilt and all the volunteer staff. 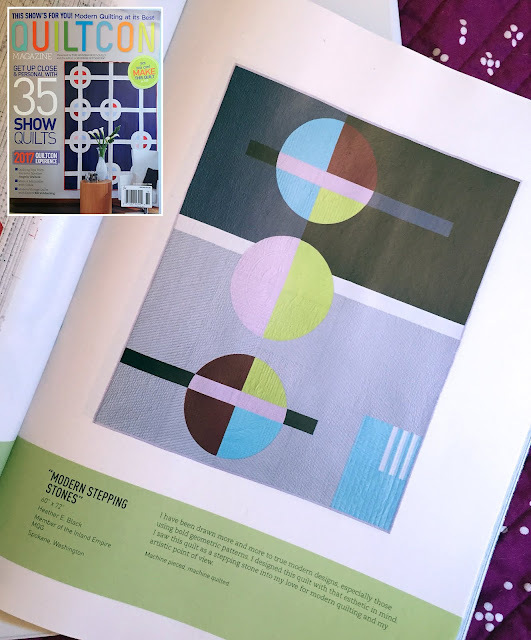 Along with hanging in Quiltcon, Modern Stepping Stones was also included in the Quiltcon Magazine! Even though I didn't receive any ribbons this year I'm very pleased with the reception my quilts appeared to have had. Winning a ribbon isn't the main reason I enter quilt shows, far from it but it is very exciting to get one. The first reason I do it is I love to make quilts, followed by I like that entering shows keeps me challenged. The third reason I enter shows are the judges comments. I love getting the feedback and last year I learned so much from the few comments I received on Summer Sunset and Changing Hexies. Unfortunately this year I did not receive any constructive criticism and it's not because my quilts are perfect, far from it. It doesn't appear, at least from my four quilts, that the judges this year were doing that and that's fine it's their decision to make but it did leave me a little 'lost at sea' feeling. 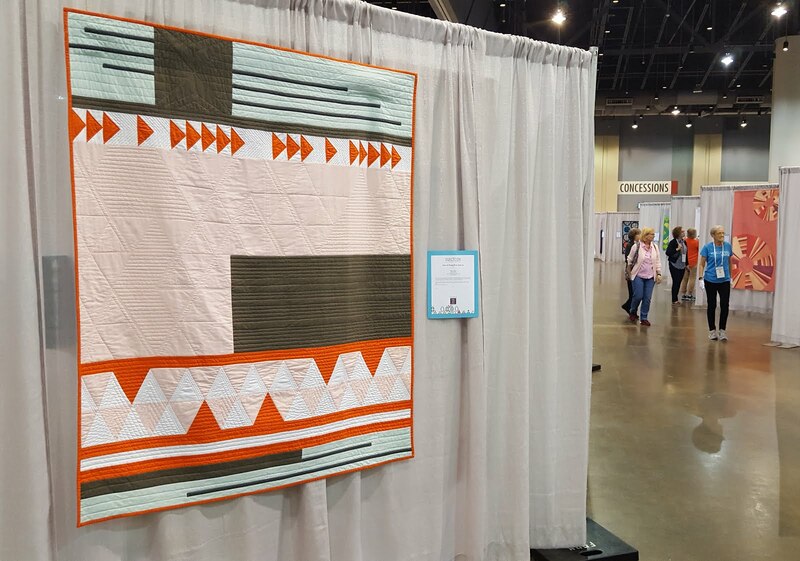 Quiltcon and the Spokane Interstate Fair are the only times I've ever received judges comments and last year's fair judge just wasn't into my quilt. I guess I'll just keep plugging away and try to improve on the things I see need work, like my quilting and paying attention to little details. I'd love to enter my quilts into more shows but I just don't know of many. My grandmother lives in the Seattle area and it'd be fun to try and get a quilt or two in a show for her to go to but I really don't know of any, I don't think Puyallup or Bainbridge are options for her. There is an exhibit at Quilt Festival I can enter and there is always the long shot Fall Puduchah but I'm kind of waiting to see what the MQG offers before I commit to an AQS show. My mind is spinning. I hope everyone enjoyed Quiltcon regardless of whether you were able to go or not. 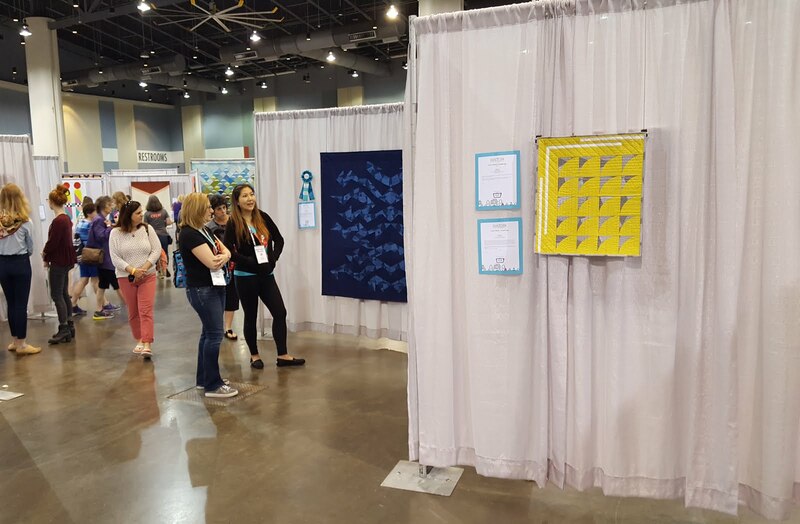 *There are more pictures under the Show Quilts tab. Congratulations! I love your "Modern Stepping Stones" and will watch out for it when it reaches Australian shores. Thank you! I hope you get a chance to see the exhibit I can't wait to see the Quiltcon quilts in person too.